Sue Raimond, considered a pioneer of harp enrichment/therapy for pets and people, is among the world experts in the field of cyto-cymatics and vibroacoustics pertaining to the harp. She was educated at the University of Maryland (Wiesbaden, Germany extension), and later at California State University, Long Beach. Sue is an adjunct lecturer specializing in pain management at UC San Diego at Thornton and Hillcrest hospitals and for the International Harp Therapy Faculty in Richmond, VA. Tufts University veterinary school hosted Sue as a speaker for its International Animal Expo as well as UC Davis for the 1st International Veterinary Symposium on Hospice Care for Animals. Most recent lectures have been for the 3rd International Healing Sound Conference in Santa Fe, NM—with 15 countries in attendance and University of San Diego. Additionally, the Scientists Center for Animal Welfare (SCAW) in Baltimore, M.D. had Sue address their annual convention. Educators nation wide recognize and recommend her CDs for pets with separation anxiety, thunder phobia and various behavior modification needs. Sue’s most recent zoo work includes establishing a harp enrichment program for the San Diego Wild Animal Park (African and Asian elephants); San Diego Zoo (primates); and the Franklin Park Zoo in Boston, MA (gorillas, zebras and giraffes). Veterinarians, ranchers and animal shelters in Dallas, TX also use harp enrichment at their facilities to calm residents, eliminate negative behaviors (i.e. cribbing), and facilitate easier birthing. Rescue facilities such as “Lions, Tigers and Bears” have also invited Sue to work with their tigers and larger breed cats as prescribed enrichment. Publications featuring Sue’s work include: Hallmark magazine; Country Living magazine; New York Post; MSNBC.com; YahooNews.com; Tufts’ University Your Dog and Catnip magazine; Joshua Leed’s Through a Dog’s Ears and the Power of Sound; The Goldsteins’ Wellness & Longevity book; Julia Szabo’s The Underdog; Grace magazine; International Harp Therapy Journal; Alpine Sun newspaper; San Diego Union Tribune newspaper; Arden Moore’s The Cat Behavior Answer Book; and Love of Animals magazine. Dish Network’s new program: Natural Companions; Disney’s Animal Planet: Petsburg, USA and You Lie Like A Dog along with ABC Radio Australia to round out some of the media adventures. The field trials of harp enrichment for 20 undomesticated Alaskan wolves continues to provide education and enlightenment to viewers on Animal Planet. 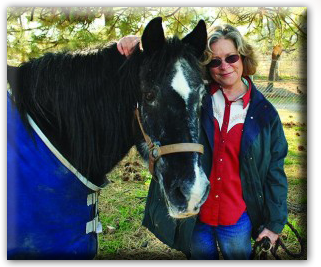 The U.S. Army Medical Research Institute for Infectious Diseases (USAM-RIID) consulted with Sue regarding use of harp as enrichment for animals and published, with Sue Raimond as co-author. The results of the study on African Green monkeys appeared in the Journal of Medical Primatology, April 2007. Balancing her schedule, Sue continues in her 25th year as a Firefighter/EMT; and continues her work as author, filmmaker and composer with over 14 CDs, books and films to her credit. Recently, Sue accepted the position of consultant for the National Standard Board for Therapeutic Musicians and a position on the Advisory Board for Sound and Music Alliance in 2010/2011.